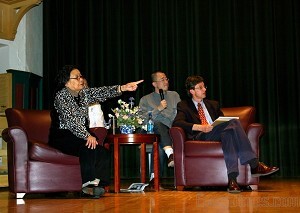 Dr. Gao Yaojie, a retired obstetrician from mainland China on a month-long visit to the United States, discussed the current AIDS situation in China at the Illinois Wesleyan University in Bloomington, Illinois, on March 26, 2007. This is her third and the last stop of her U.S. visit. In her 90-minute talk, Dr. Gao detailed how AIDS was ravaging Henan Province in China. After showing a video documentary in English, she presented four slide presentations in Chinese: the disaster of blood sales, the situation of the spread of AIDS, AIDS orphans, and family members of AIDS victims. The audience asked many questions after her speech. A man came up and bowed to Dr. Gao to express his appreciation for her work. Some Chinese people stayed in the auditorium afterward to talk with Dr. Gao. One person said, “Dr. Gao, why are you going back to China? Won't the Chinese Communist Party arrest you? You shouldn't go back!” Dr. Gao replied, “I am over 80 years old. What do I fear?” Dr. Gao told a reporter that she was touched by the American people she met. “American people are so sincere and kind. The Chinese people living here are also very caring.” She also said she was worried about the future of China. She donated her report on a CD-ROM and two of her books on the AIDS situation in China to Wesleyan University after her speech. Dr. Gao admitted that she was not optimistic about the AIDS prevention and treatment situation in China. She doesn't believe the Chinese government is doing all it can to curb the spread of AIDS. The annual increase rate of AIDS hovers around 30 to 40 percent. Dr. Gao described the demoralizing effect AIDS has on the victims. One 26-year-old AIDS patient named Xiao Feng wanted to give his blood to others. Dr. Gao stopped him and asked why. Xiao Feng said he wanted his contaminated blood to bring the disease to the government officials who had made possible the spread of AIDS. One of Dr. Gao's photos showed several AIDS patients holding various certificates for selling blood. There were at least four different kinds. Dr. Gao said that in one of the villages she visited, 1,500 of the 3,000 villagers sold blood. Eight hundred people were already infected. In another village, everyone says that everyone in the village, except for domestic animals, are all infected with AIDS. Dr. Gao gave several vivid examples to illustrate how many patients were infected with AIDS through no action of their own. A little boy named Zhou Fenglin, born on October 2 of 2004, fell over from a sofa on Aug. 23, 2005. His parents rushed him to a hospital for rescue. He got infected after a transfusion and died on June 9 the next year. Another little boy had umbilical inflammation three days after birth; he was also infected with HIV as a result of a transfusion and died when he was four. A female college graduate got infected due to a transfusion performed during an operation; as a result, she became completely blind. Her husband later divorced her. Doctor Gao addressed the question by telling the audience that the major problem is the blood supply; the orphan issue is yet a minor problem in comparison. If the contamination in the blood supply cannot be resolved, more people will get infected from transfusions. In turn, there will be more AIDS orphans, if the root of the problem is left unaddressed. Gao said, “Presently, I am not taking care of any AIDS orphan; neither do I have the capability to do so. I myself have poor health. I was once awarded $80,000 U.S. All the money was spent on helping the orphans.” Gao also exposed the dark side of AIDS treatment and prevention in China. “The scariest part is the people involved.” She said, “Nowadays, some people swindle money under the banner of AIDS treatment, AIDS prevention, and taking care of AIDS orphans. Gao, who turns 82 this year, was a well-regarded obstetrician before she retired. She started to concern herself about AIDS patients as well as AIDS prevention and treatment in 1996. Out of a sense of professional ethics, she visited several hundred villages and exposed the true stories of the spreading of AIDS inside China to the outside world. Her courage has been hugely acclaimed and respected by both Chinese people and Western societies. Gao encountered numerous difficulties when trying to come to the U.S. She had been under house arrest since Feb. 1, 2007. However, on the evening of March 14, she accepted the Vital Voices Global Leadership Award in the human rights category at the JFK Center for the Performing Arts in Washington DC. Upon receiving the honor, Gao spoke of the pressure she felt due to the threats from the CCP. “I cannot stay in the U.S. for too long. I have to go back to China. What shall I do to handle all the problems facing me when I return to China? I am in deep trouble and in the midst of a huge dilemma. Indeed, I can hardly imagine the consequences … Currently, my child is even being monitored because I came here to accept this award,” she said. On March 21, Gao gave a speech to the local community in New York City at Flushing Library, in Chinatown. Her speech was abruptly brought to an end in less than seven minutes. Moreover, she refused to be interviewed by any of the many Chinese media outlets attending the meeting. The audience was left dumbfounded. Many believe that the CCP was giving Gao tremendous pressure behind the scenes.